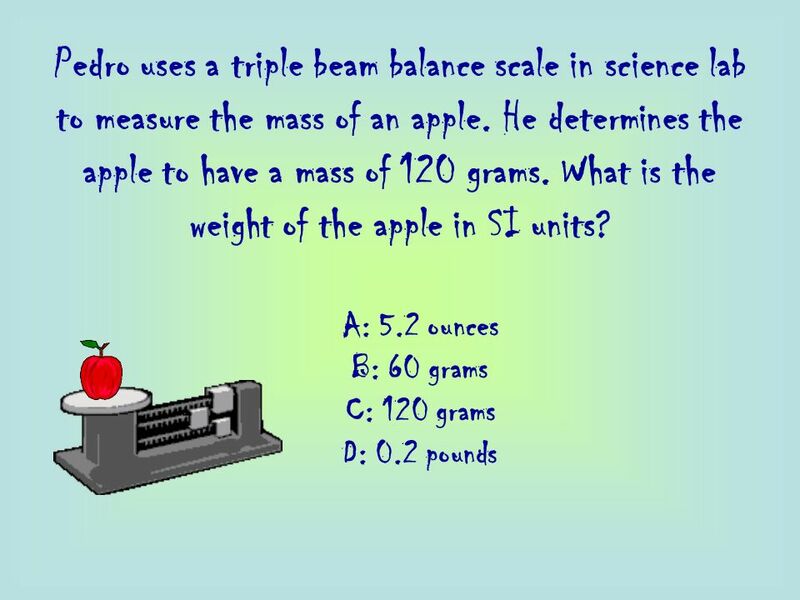 3 Weight is the measure of the pull of gravity on a given mass. Mass vs. 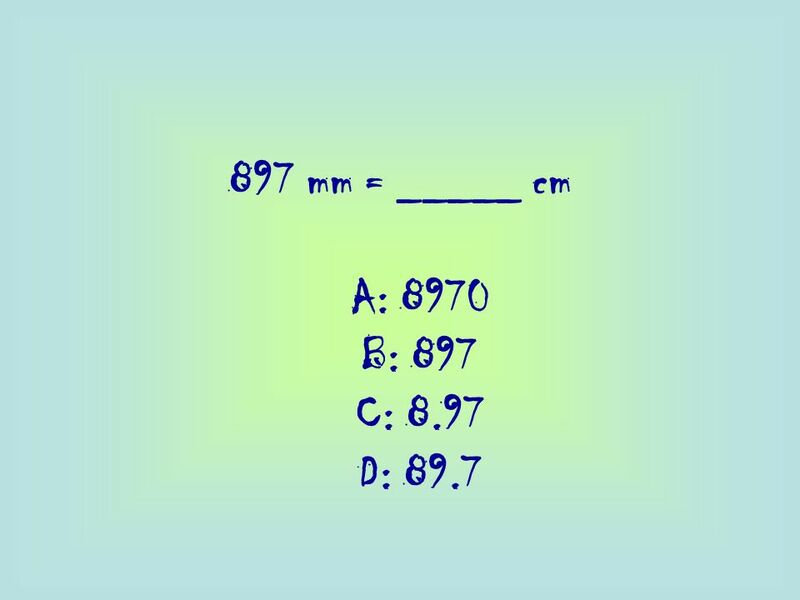 Weight??? BUT. 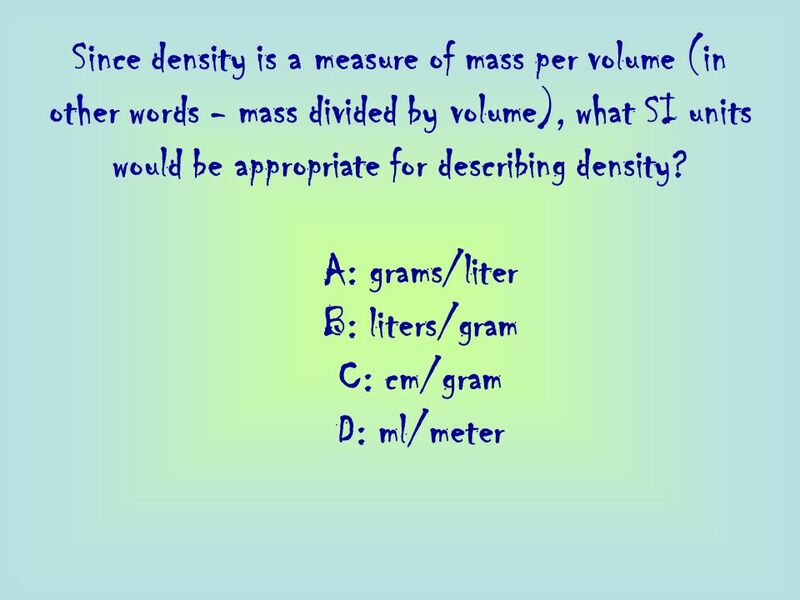 . . Mass is the measurement of the amount of matter in a given amount of a substance. 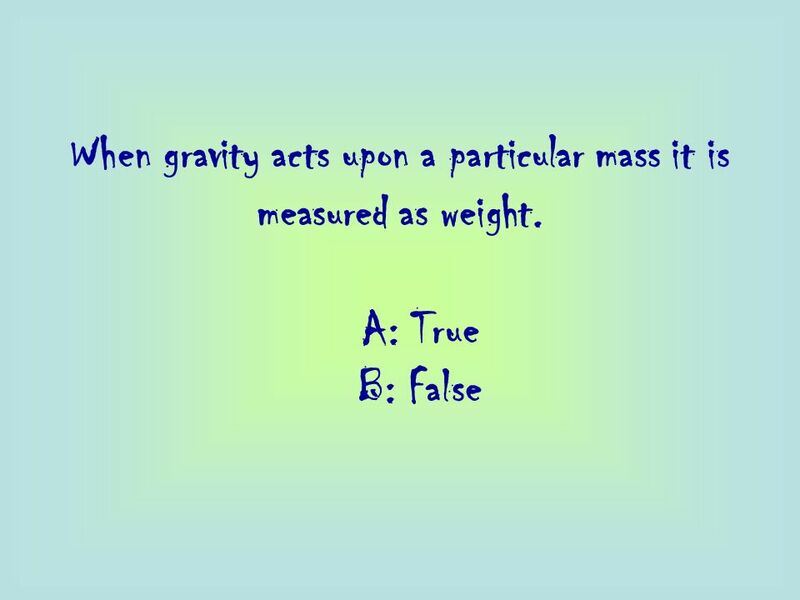 Weight is the measure of the pull of gravity on a given mass. 4 In other words. . . The weight of an object on earth is greater than the weight of the same object on the moon, since the Earth has more gravity than the moon. 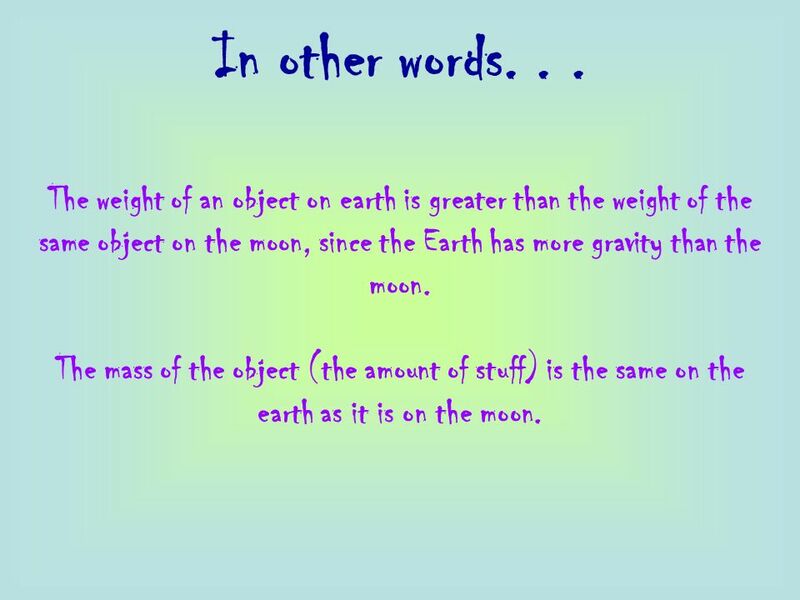 The mass of the object (the amount of stuff) is the same on the earth as it is on the moon. 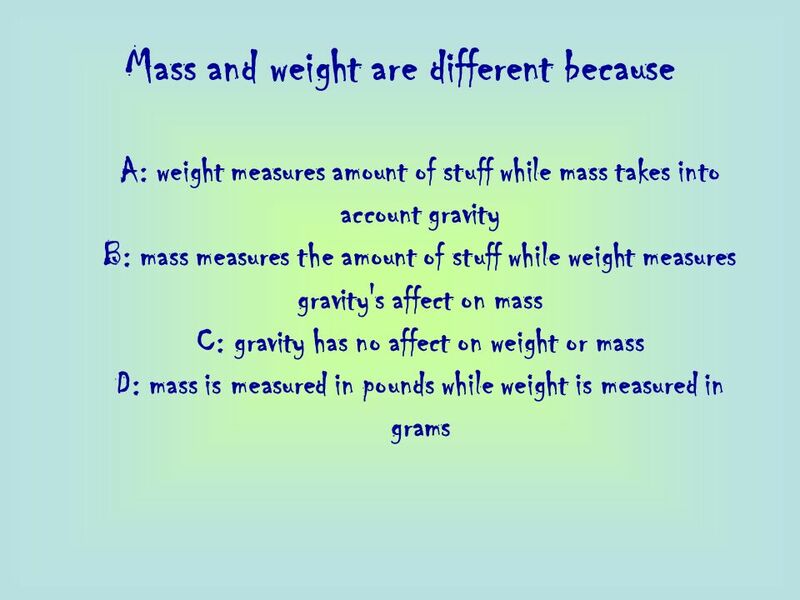 5 Weight is the affect of gravity (measured by a scale) on a given mass. 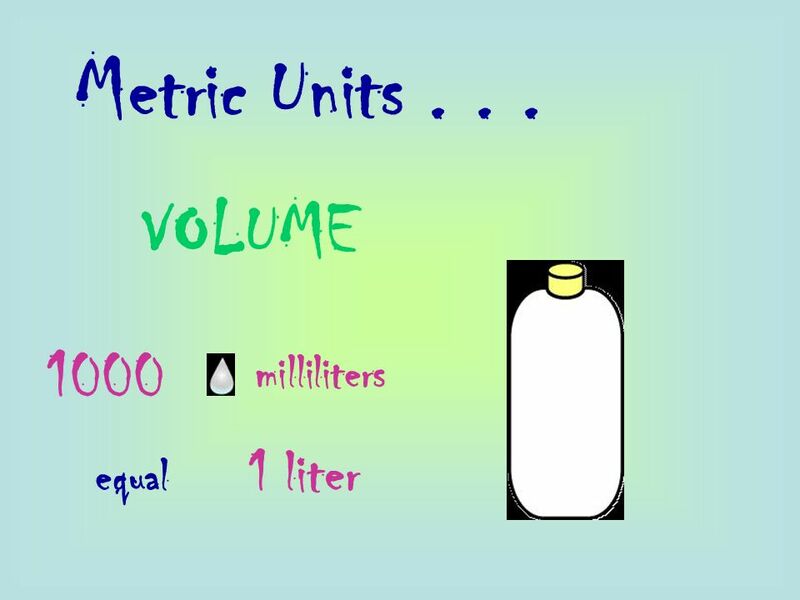 Mass is the amount of stuff. 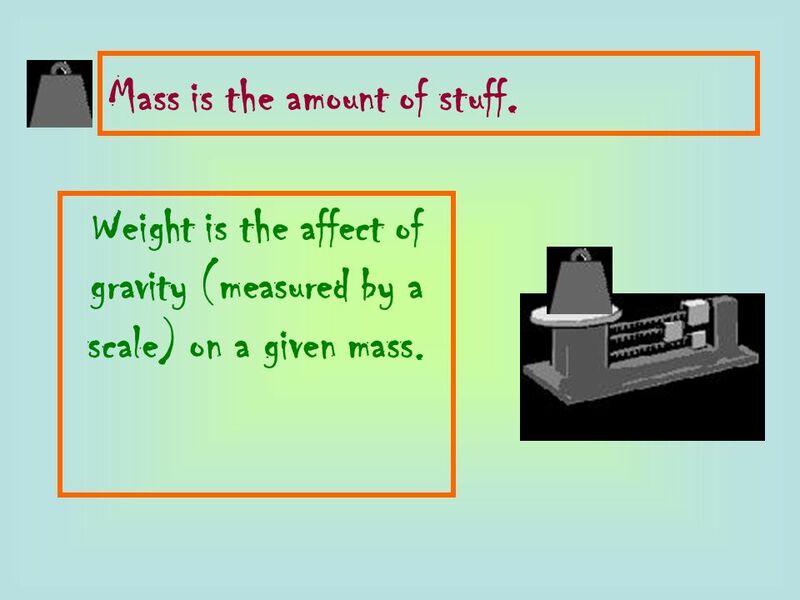 Weight is the affect of gravity (measured by a scale) on a given mass. 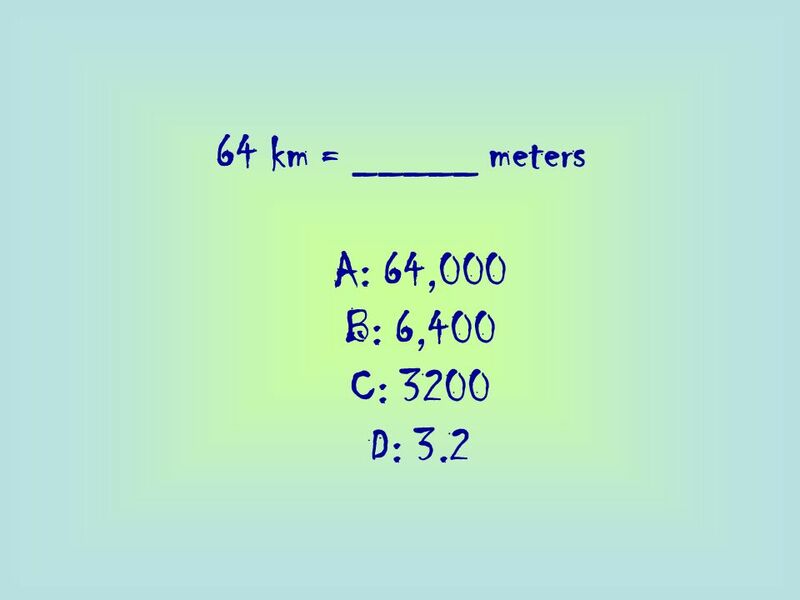 6 However . 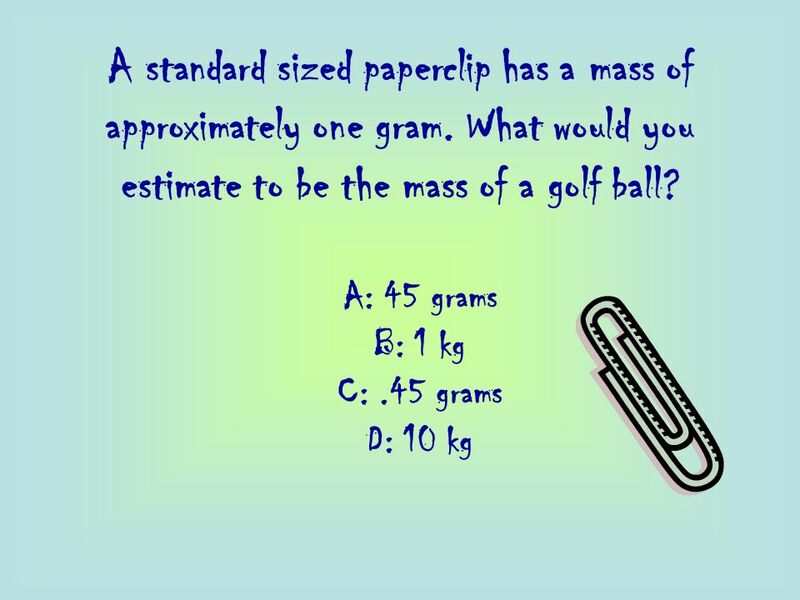 . . On Earth, the mass in grams equals the weight in grams. 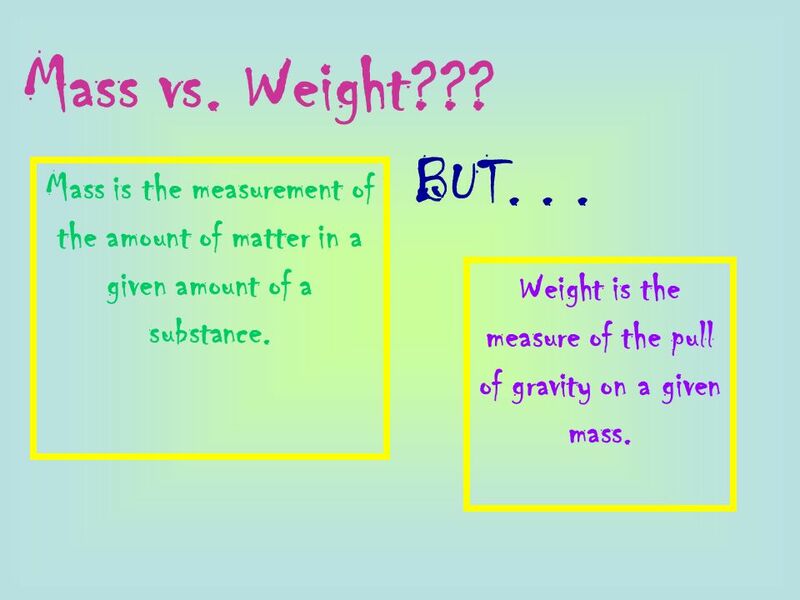 So for values ON EARTH we often use the terms weight and mass interchangeably. Just be careful, because where gravity values are different from on Earth (the moon, in space, another planet, etc.) 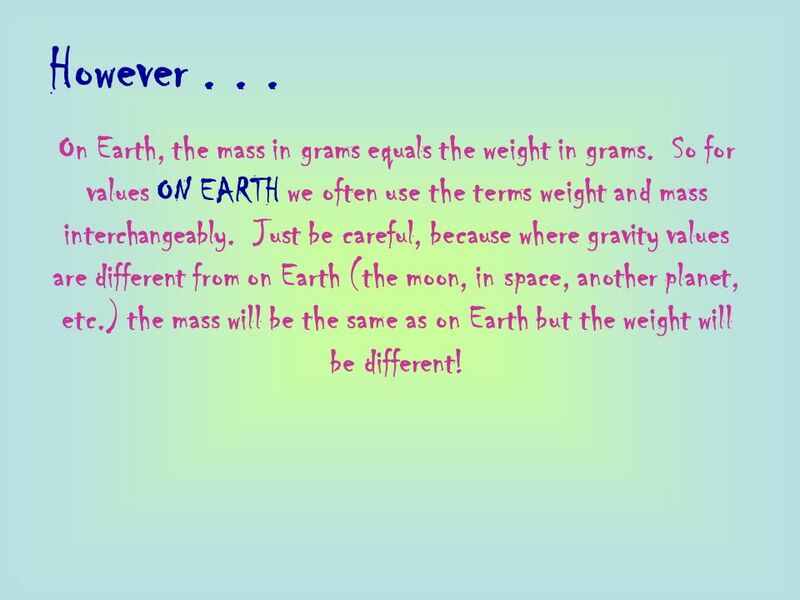 the mass will be the same as on Earth but the weight will be different! 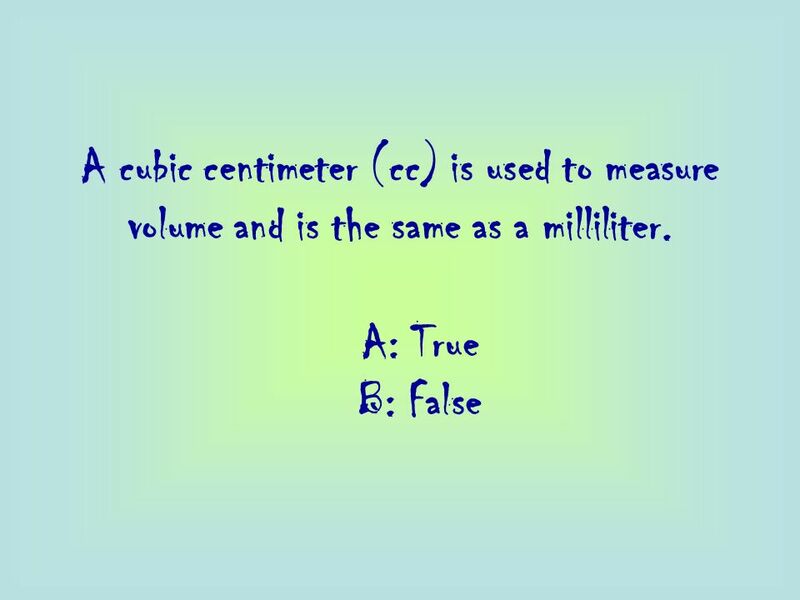 16 A cubic centimeter (cc) is used to measure volume and is the same as a milliliter. 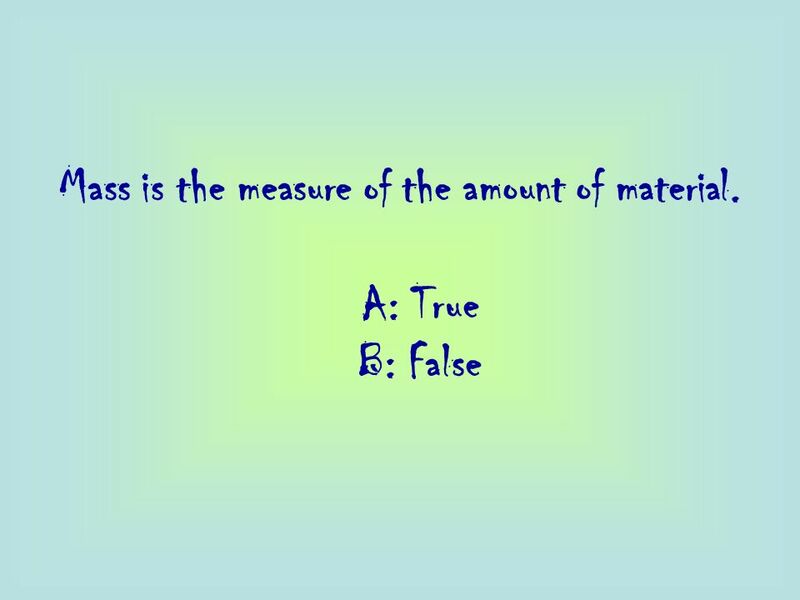 21 Mass is the measure of the amount of material. 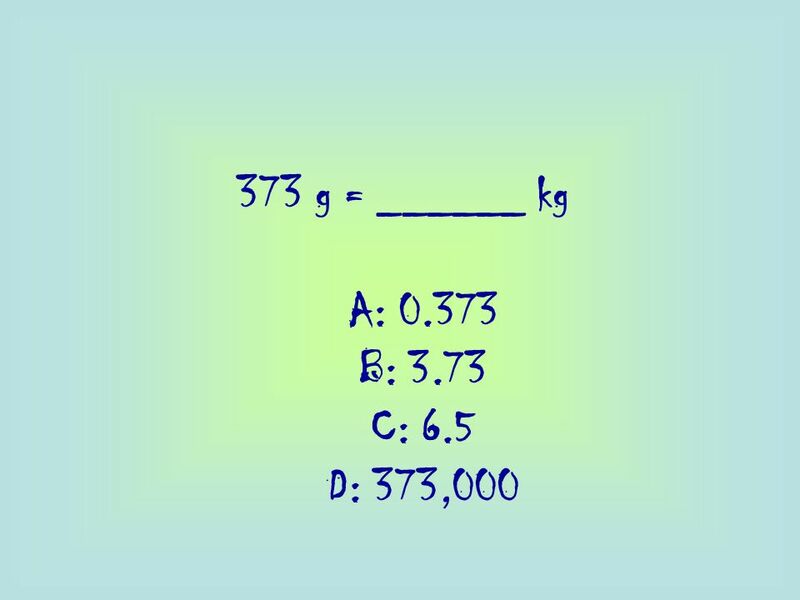 22 When gravity acts upon a particular mass it is measured as weight. 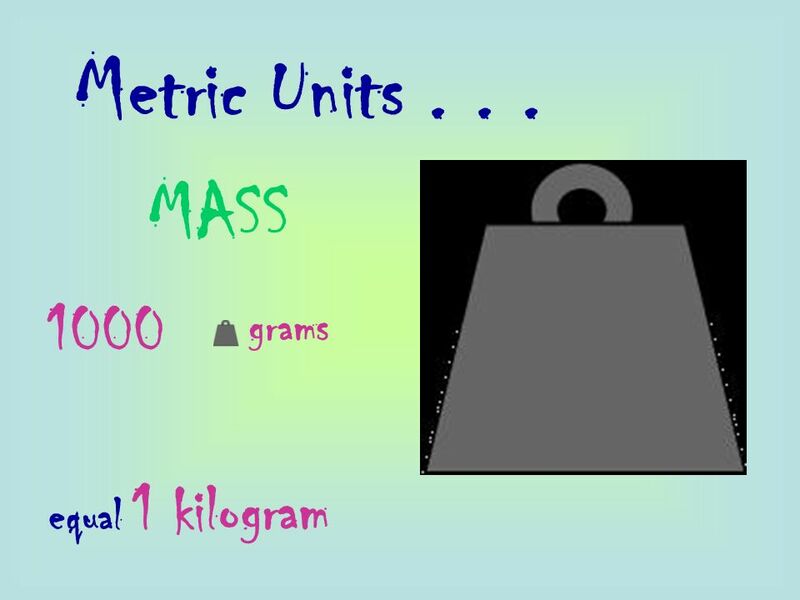 A 10kg mass is weighed on Earth and on the moon. The moon has less gravity. 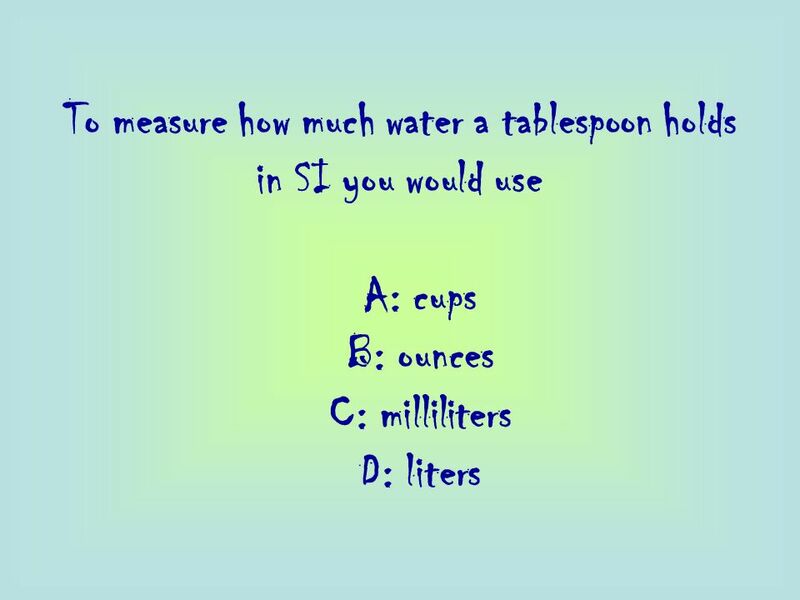 Which of the following is true? 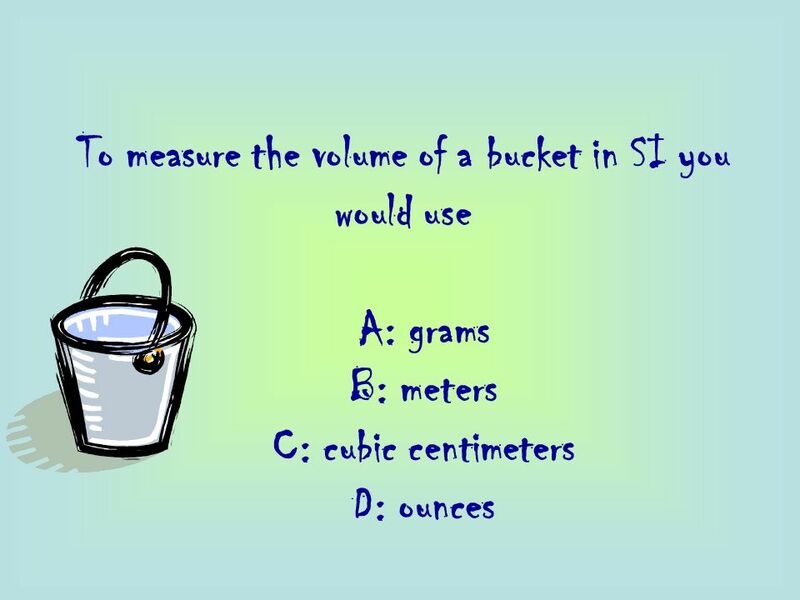 A: The mass weighs more than 10kg on Earth and less than 10kg on the moon. 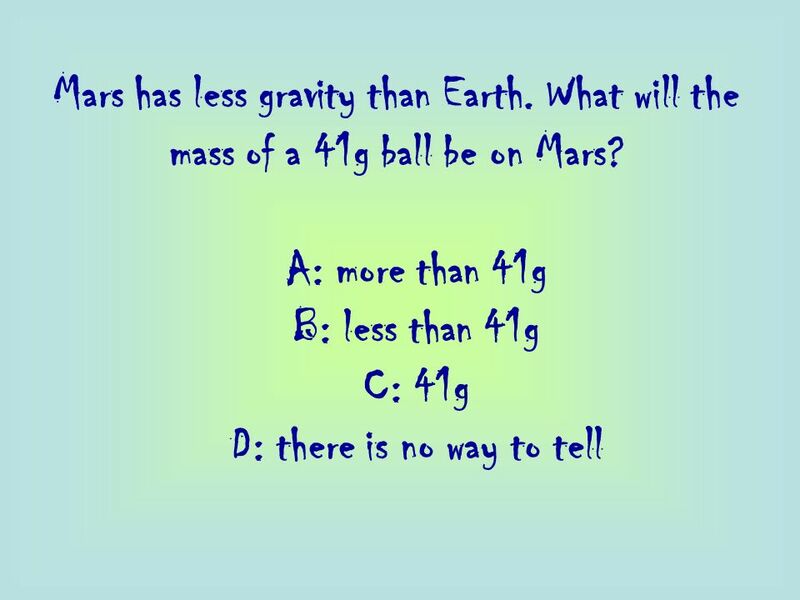 B: The mass weighs 10 kg on Earth and more than 10 kg on the moon. 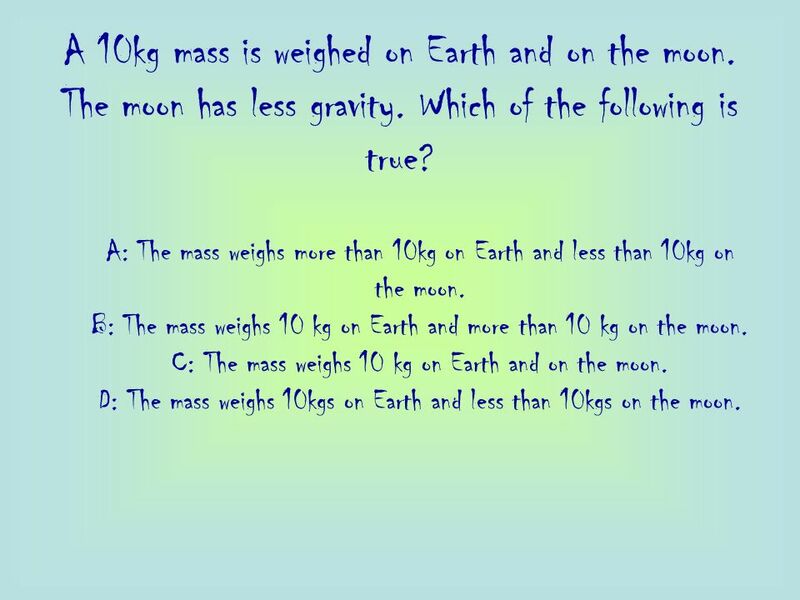 C: The mass weighs 10 kg on Earth and on the moon. D: The mass weighs 10kgs on Earth and less than 10kgs on the moon. 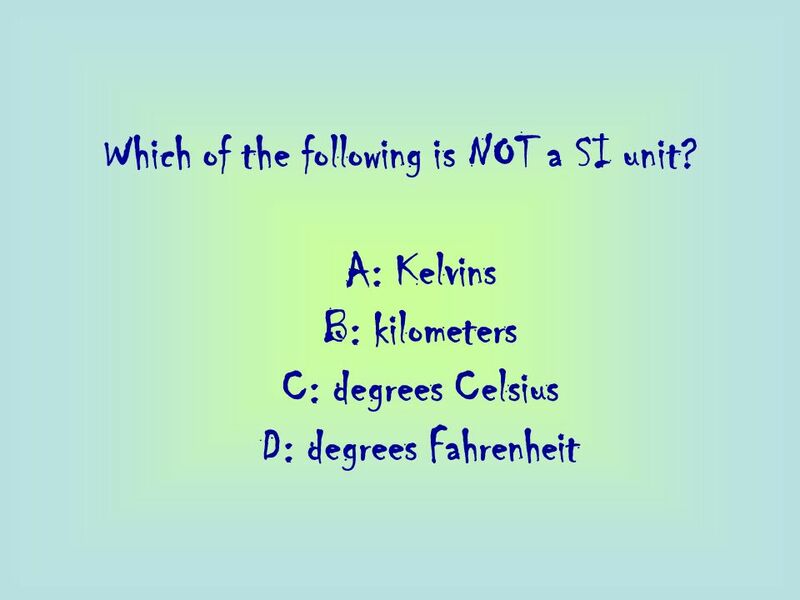 27 Which of the following is NOT a SI unit? 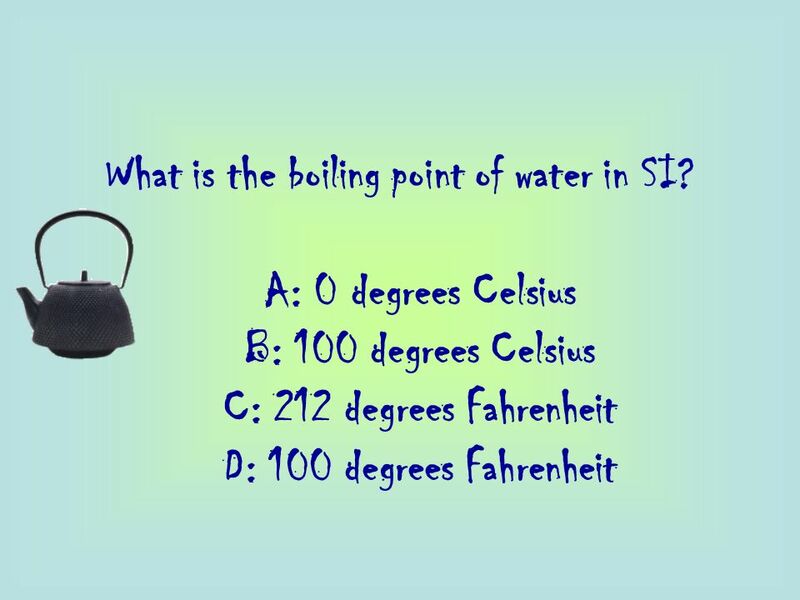 31 What is the boiling point of water in SI? 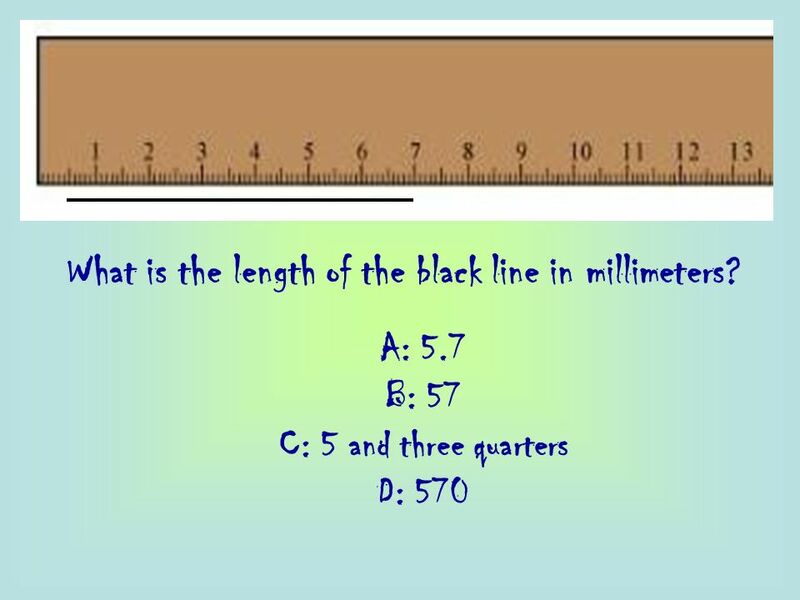 32 What is the length of the black line in millimeters? 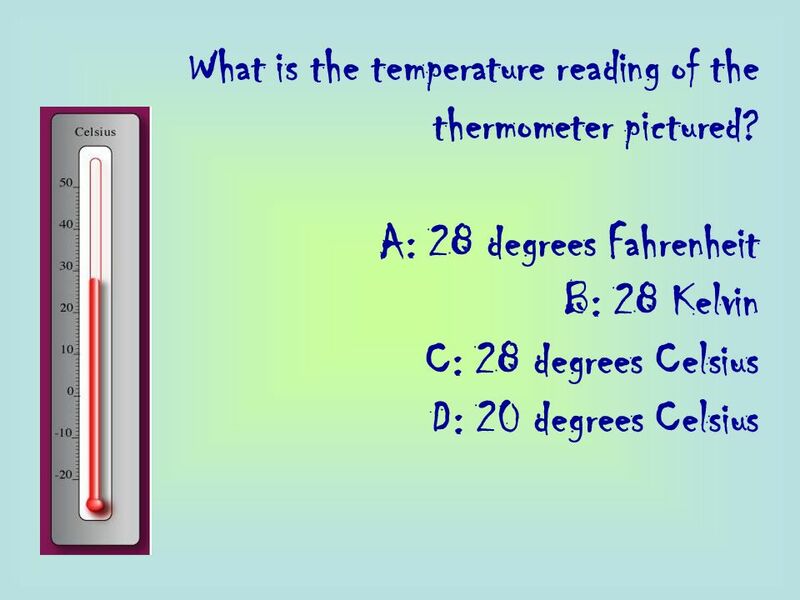 34 What is the temperature reading of the thermometer pictured? 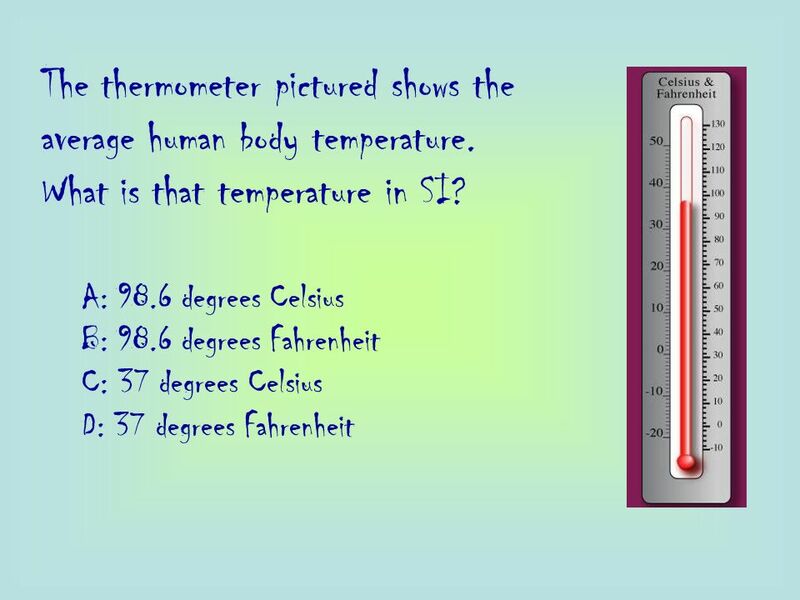 36 The thermometer pictured shows the average human body temperature. 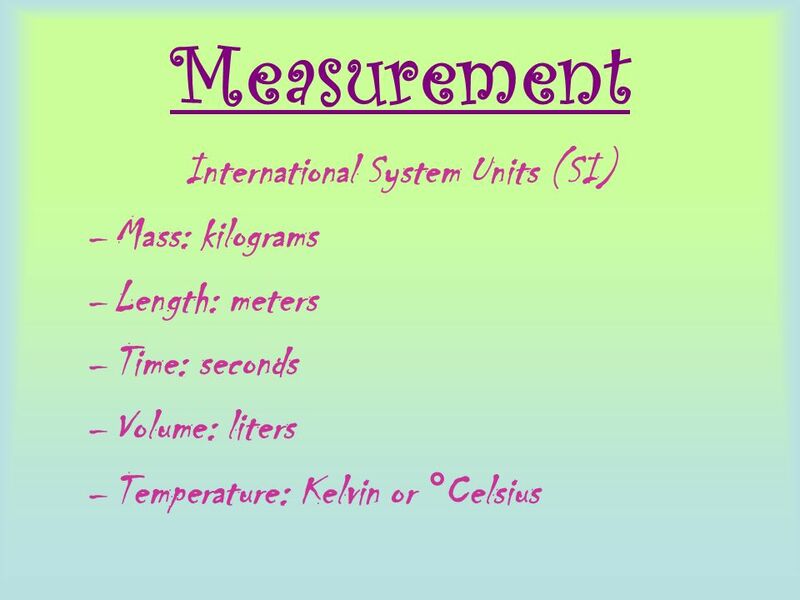 Download ppt "International System Units (SI)"
Why is a standard measurement system important? 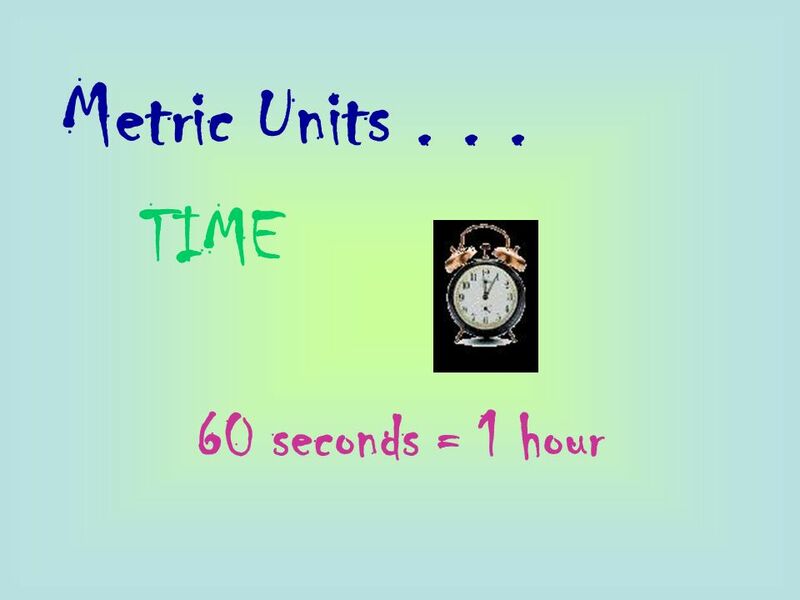 The Metric System. 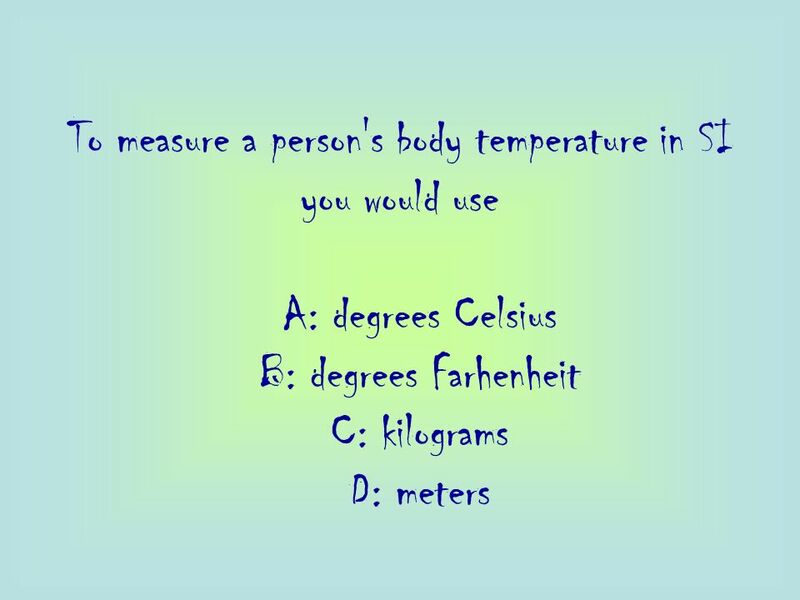 1.The Metric System a. Standard system used by scientists. b. AKA S.I. 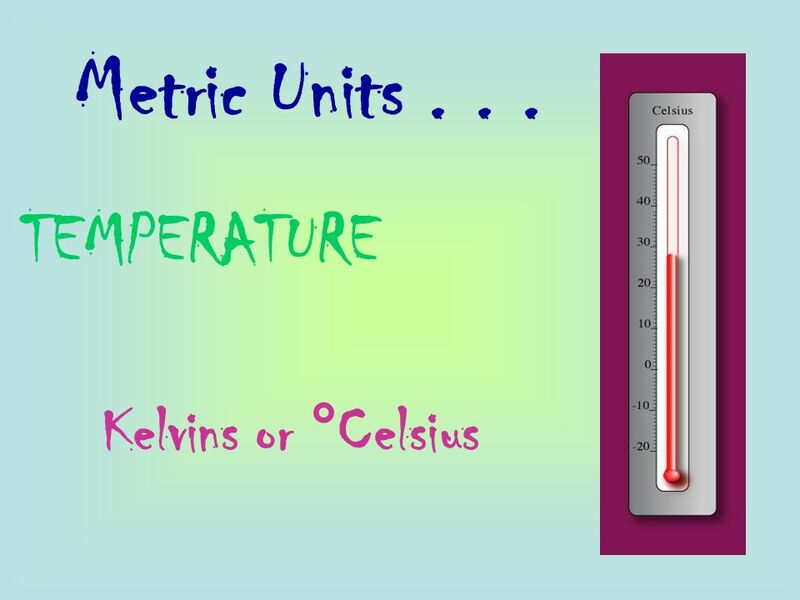 (International System of Units) c. Decimal System based on the. 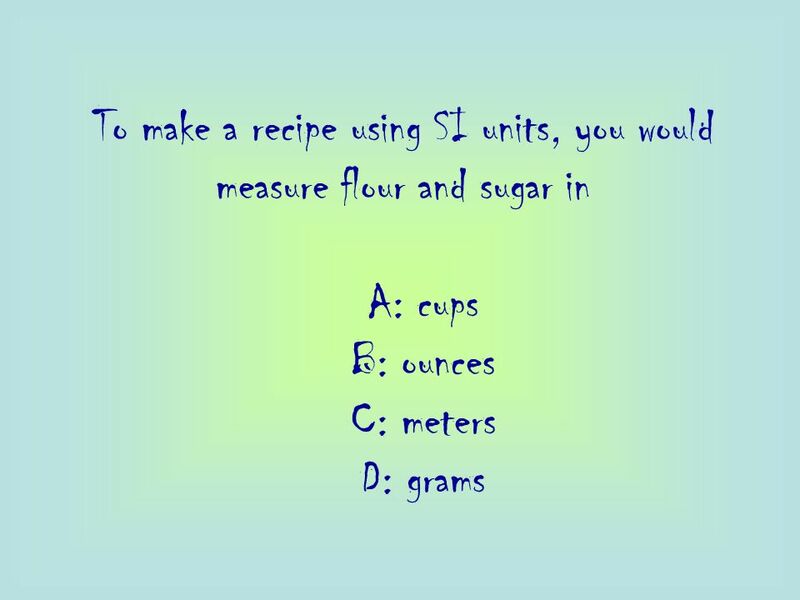 Measurement Getting Ready for Science Labs. 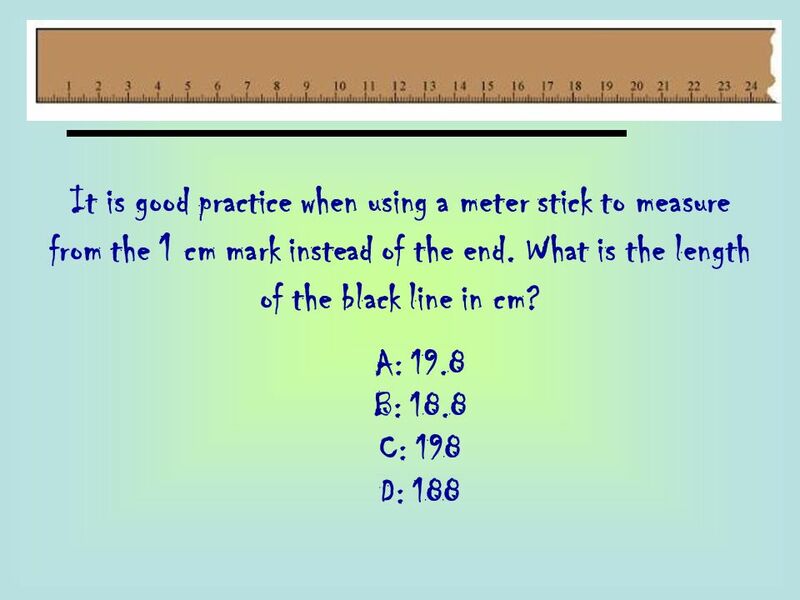 Measuring Length Length and distance are measured in millimeters (mm), centimeters (cm), meters (m), or kilometers. 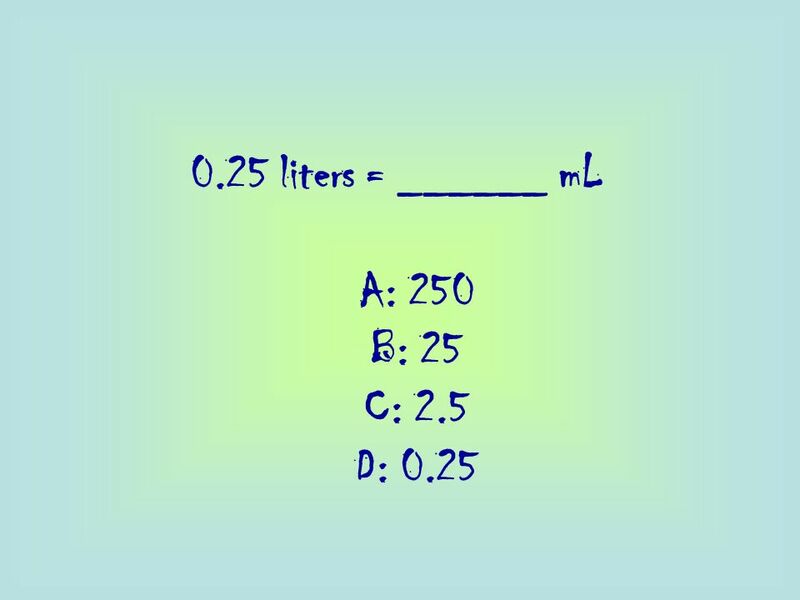 MATTER– Anything that has MASS and VOLUME. 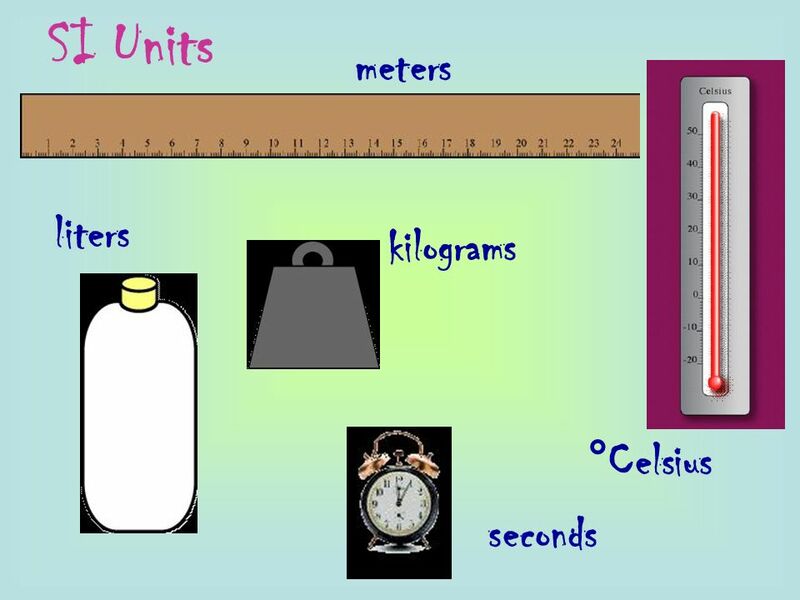 Tools for Measuring some Physical Properties of Matter Fill in your vocabulary map with the following information! 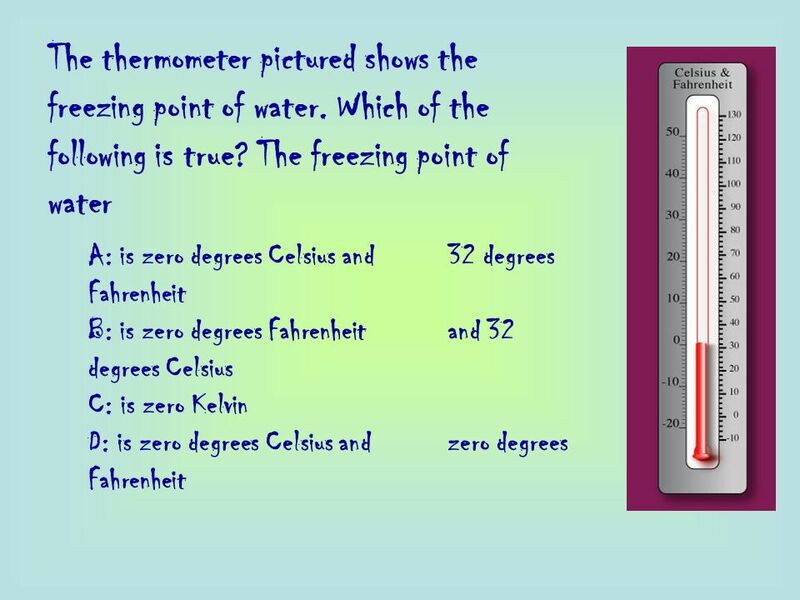 Measurement Chapter 2 Section 1. 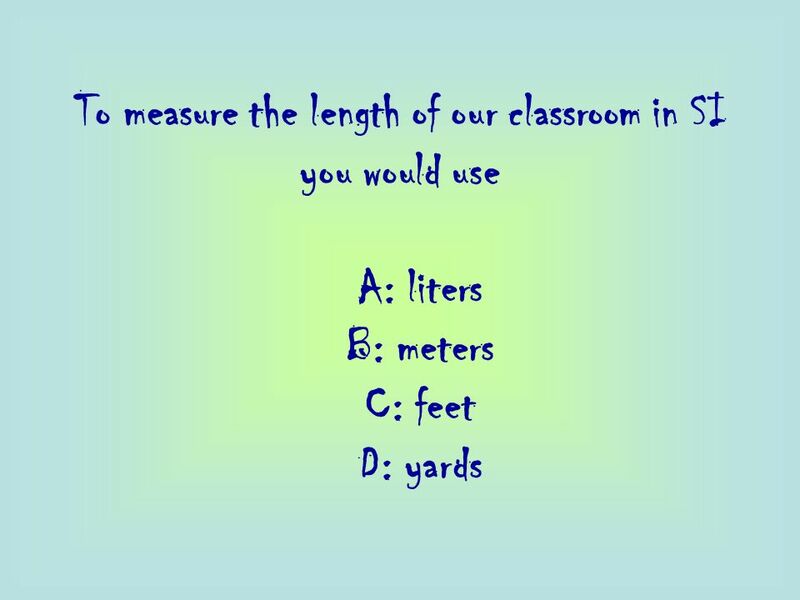 Standard measurement System The universal system of measurement is the metric system. 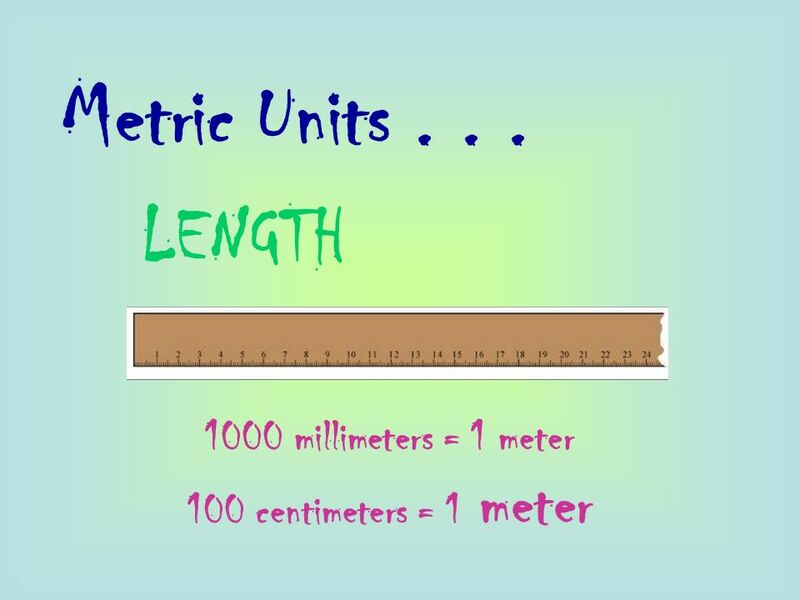 The metric system is based around.